Claue - The best woocommerce theme for online fashion store, personal blog. Thank you for purchasing EmallShop - Responsive Multipurpose WooCommerce Theme! In this document you will find information on how to install, manage and update your theme, as well as create content, install plugins, import Demo data etc. For the latest version of this Document please visit the Online Documentation. If you have any questions that are beyond the scope of this help file, please feel free to contact us via Support link. We will do our best to answer you in shortest of time. If you need help installing WordPress, follow the instructions in [WordPress Codex](http://codex.wordpress.org/Installing_WordPress). Below are all the useful links for WordPress information. [WordPress Codex] - General info about WordPress and how to install on your server. 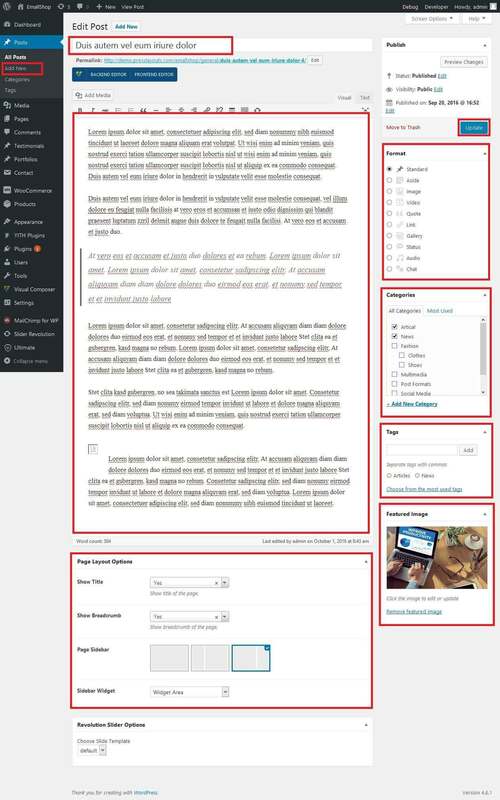 [First Steps With WordPress] - General info about multiple topics about WordPress. [FAQ New To WordPress] - The most popular FAQ’s regarding WordPress. If you've downloaded whole theme package, unzip it. There you will find the theme installation file , documentaion, emallshop.zip, emallshop-child.zip, etc. Alternatively you can simply download the installable WordPress file. Go to Appearance > Themes. Click the Add New button or Add new theme link. (check screenshot below). Click on the Upload Theme button. Locate emallshop.zip and click Install Now. Click on the Activate button to activate EmallShop. Now click on the left side EmallShop Active Menu and activate EmallShop theme using purchased code. Congratulations, you have now activated EmallShop! You can now proceed with EmallShop's Plugin Installation. Login to your Hosting server using an FTP client (like FileZilla or WinSCP). Locate emallshop.zip that you found in your ThemeForest Package and unzip it somewhere on your hard drive. Once it is unzipped it will look like a folder named emallshop with all theme files in it. 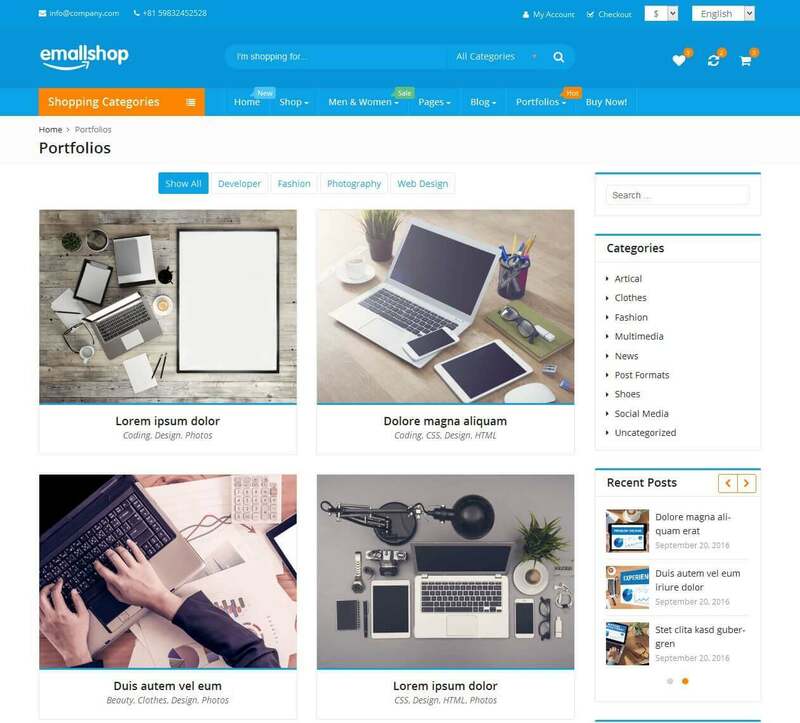 Locate your Wordpress installation and upload the theme directory emallshop	(you unzipped in the previous step) into ../wp-content/themes/ in your Wordpress installation. Click on the Activate button to activate EmallShop. Congratulations, you have now activated EmallShop! You can now proceed with EmallShop's Plugin Installation. Once your theme is installed you will get a prompt at the top of your Dashboard that will ask you to install EmallShop's plugins. Follow below step and install and active plugins. Click on the Begin activating plugins links Or Go to Appearance > Install Plugins. Select all plugins that you wish to install (Selecting all of them is recommended). Change Bulk Actions drop to Install then click Apply in order to install the selected Plugins. After all plugin Installed then click on below Return to Required Plugins Installer link. 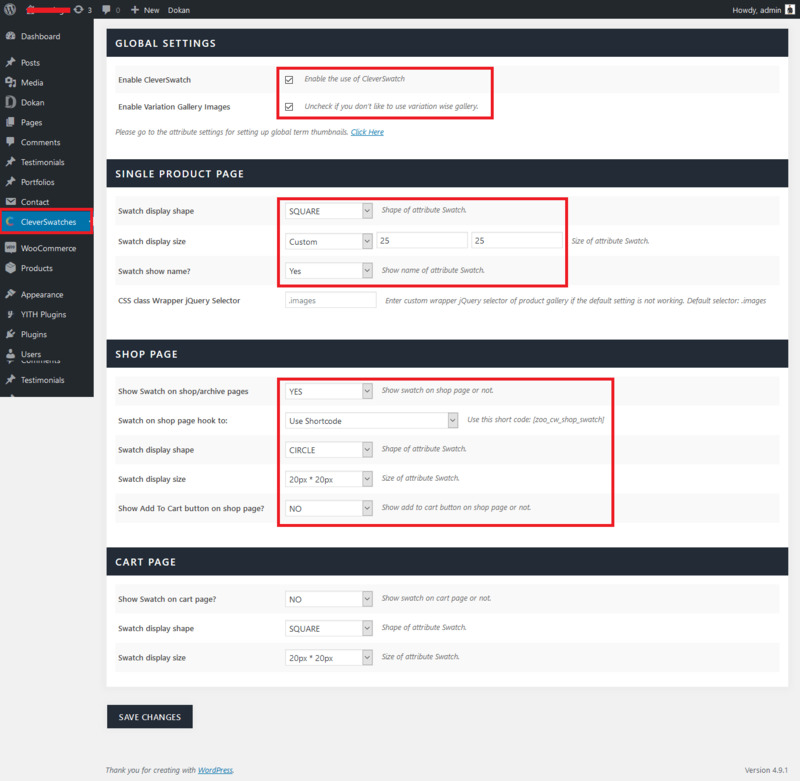 Select again all plugins and Change Bulk Actions drop to Active then click Apply order to active the selected plugins. All Plugin actived then after now go to import demo data. 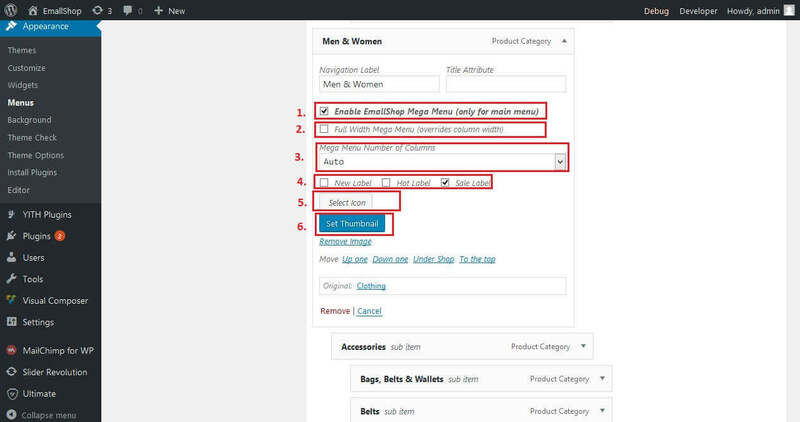 Once you have installed all theme Plugins you can import the EmallShop Demo Content. 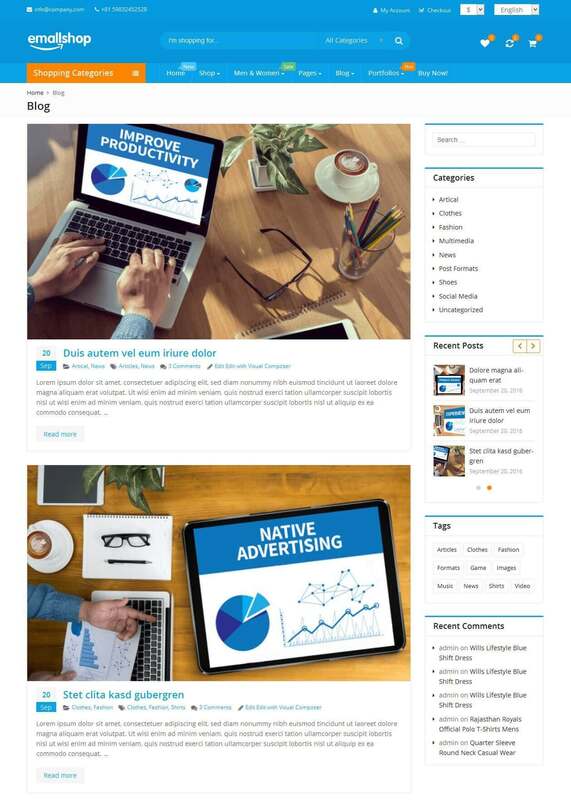 Importing demo content will copy sliders, widget, theme options, products data, posts, pages and portfolio posts, this will replicate the live demo. Go to Appearance > Theme Options > Import Demo Data. Notice-Before import demo data, You Must be need to required increase upload file size, execution time etc... otherwise generate error. Read above Theme Installation. Choose any one preset layout and click on it thumb image. It can also take a minute to complete import demo data. 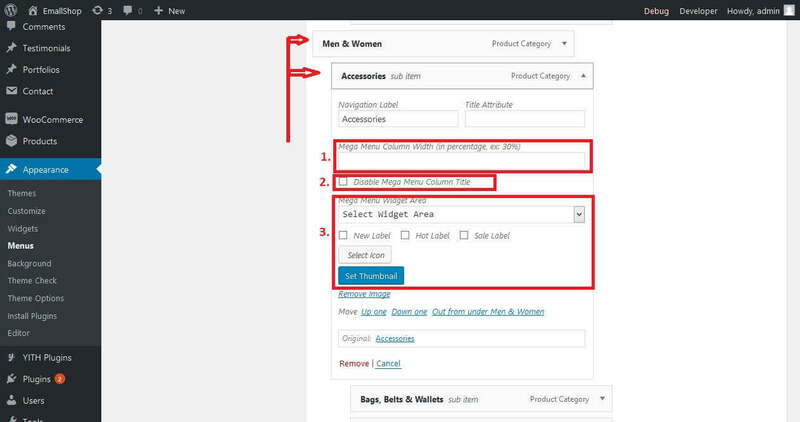 Before import demo data, You must be activated Main Theme not child theme otherwise you can't import demo data and created error (You not access this page). 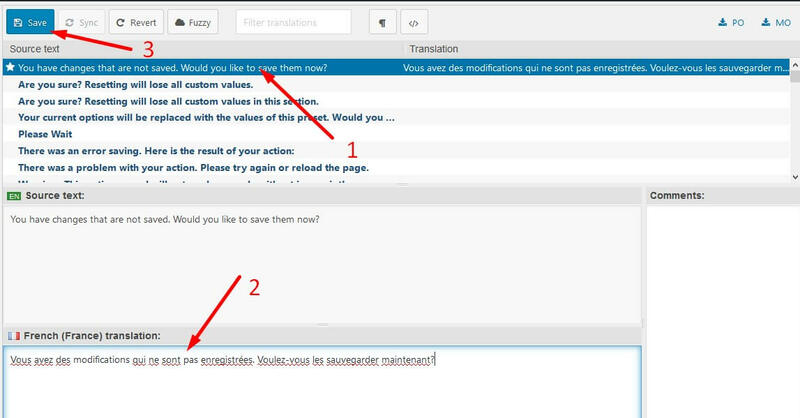 Install Loco Translate WordPress plugin. Go to Loco Translate > Themes and click emallshop theme. Choose your language and choose a location is in languages/themes/. 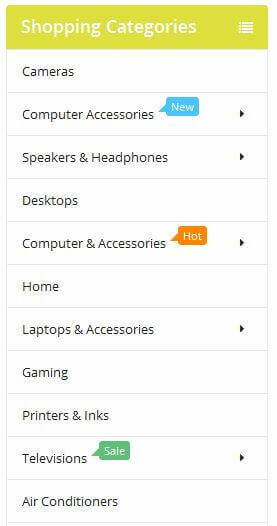 We recommend you don’t choose a location is in themes/emallshop/languages/, because after you update the theme all your custom files will be lost. 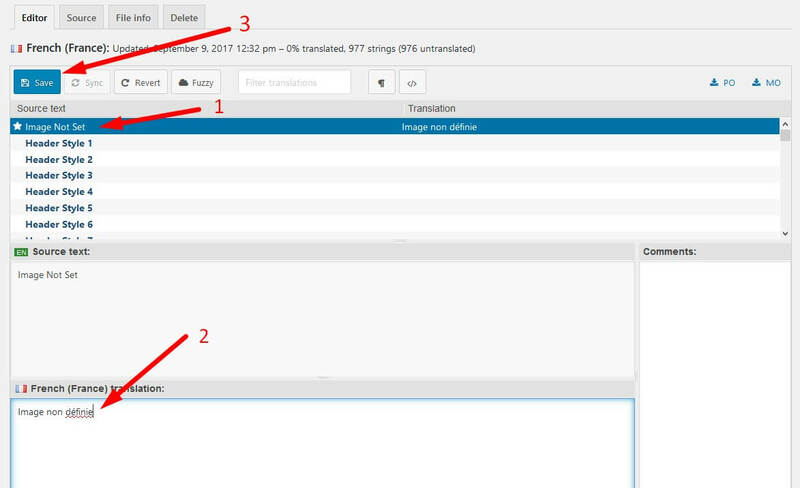 Click Source Text and enter the text you want to translate in German translation. 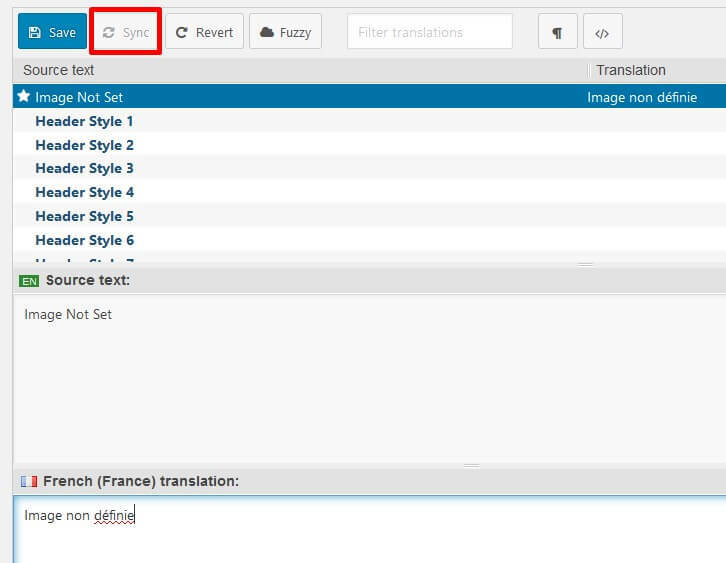 Go to Loco Translate > plugin and click emallshop theme. Notice: If you want to updating theme, You Must be take a backup first your old theme before delete theme otherwise lost your updated files. First Download Latest theme here. Go to Appearance > Themes. Deactivate EmallShop Theme by activating a different theme. 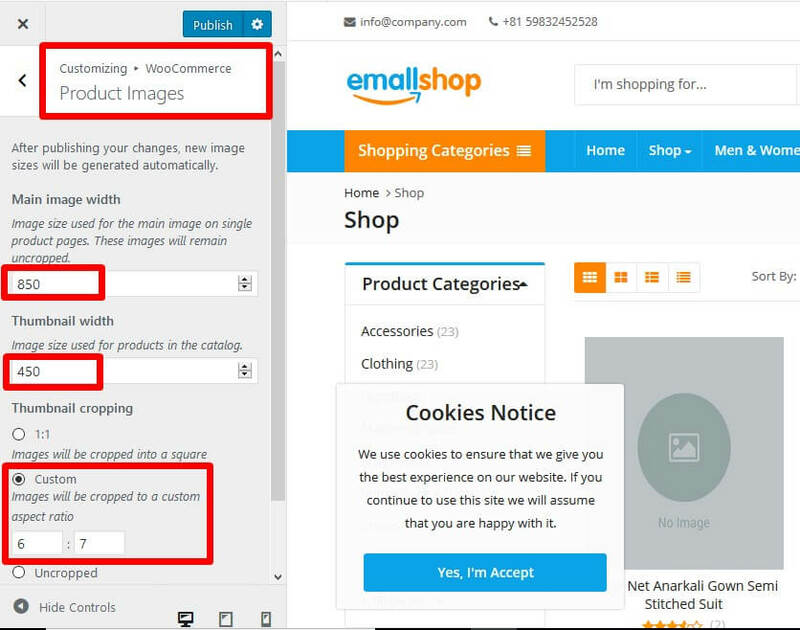 Delete exist EmallShop Theme, don't worry your content will not be lost but Must be take a backup first your old theme before delete. Upload the latest version of emallshop.zip and activate it (more info in the Install Theme section). 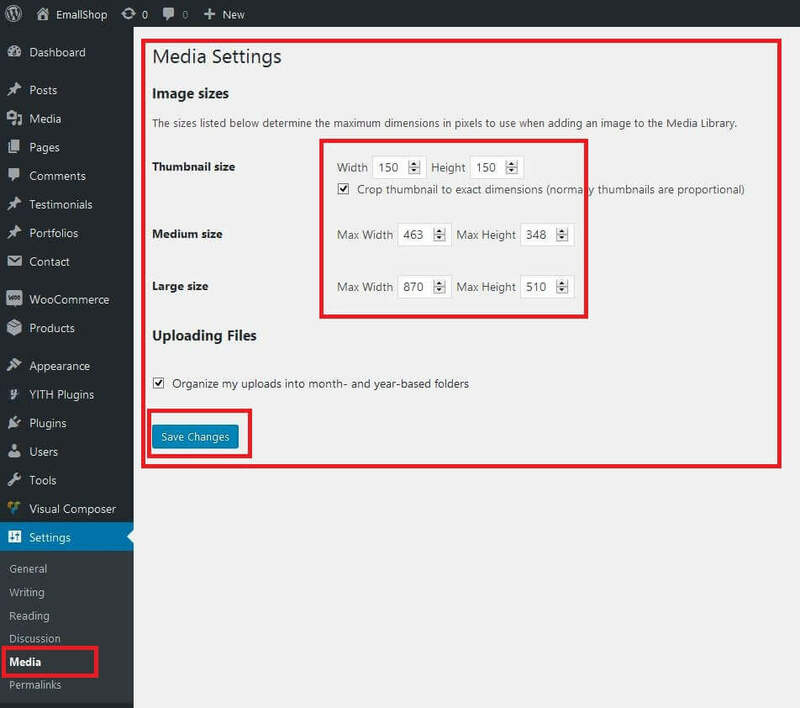 When modifying any theme files it is always best to use a Child theme, thus your file changes won’t be lost once you update your theme (check the Child Theme section for more). Go to Plugins. Deactivate You need to update plugin PL EmallShop Extensions or Slider Revolution or WPBakery Visual Composer or Ultimate Addons for Visual Composer and delete it. After deleted plugin display one above notification, So see below images and install again latest plugin. EmallShop Wordpress Theme comes with a Child Theme ready to be used. Simply install the emallshop-child.zip and activate the Child Theme just like a regular theme after you have installed EmallShop. 1) What is a Child Theme? A child theme is a theme that inherits the functionality and styling of another theme, called the parent theme. Child themes are the recommended way of modifying an existing theme. 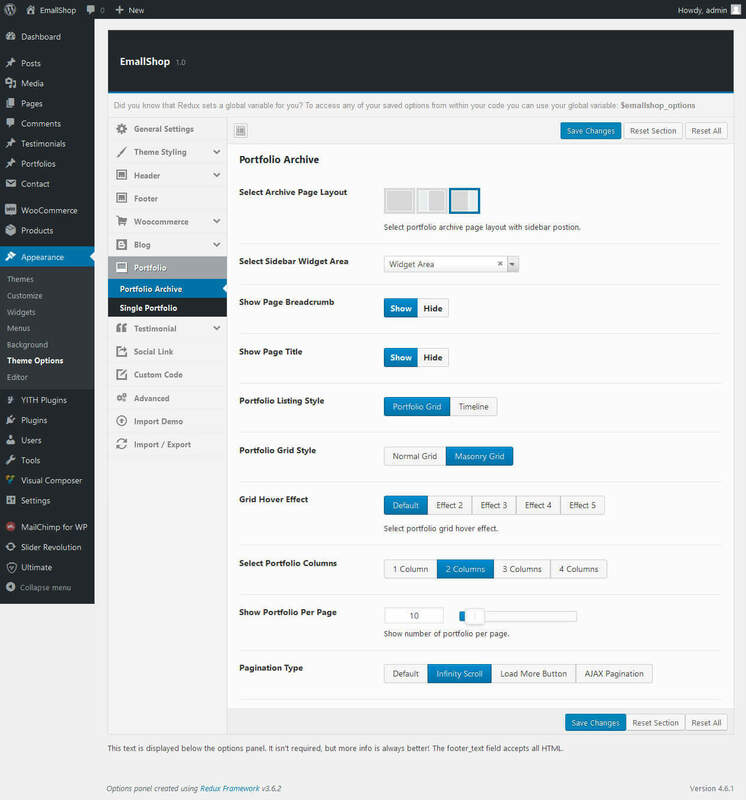 Child themes allow you to modify or add to the functionality of the existing parent theme. 2) Why use a Child Theme? Always use a Child Theme when modifying any theme files. This way you make sure a theme update will not wipe out any changes you have made to the files. There are a few reasons why you would want to use a child theme: If you modify a theme directly and it is updated, then your modifications may be lost. By using a child theme you will ensure that your modifications are preserved. To Activate the theme, Go to Appearance > Themes and activate the installed theme. Go to Settings > Reading in your Dashboard. Go to Under Front page displays select A static page (select below) from the drop down. 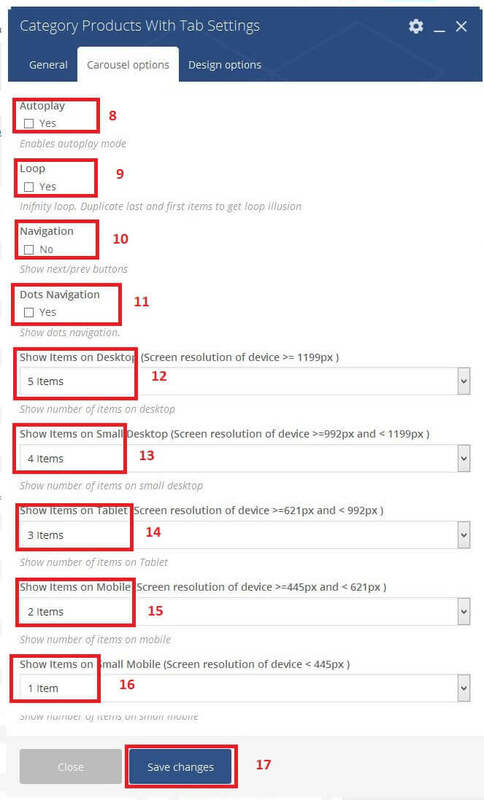 Select the Static Page you want to set as your Home Page under the Front page: dropdown. Your Menus are managed under the Appearance > Menus. This is where you create/manage your custom menus and assign them to specific locations. Go to Appearance > Menus and click on create a new menu. Name your Menu and click on Create Menu. Then use the tool to the left to add items to your menu and save it. 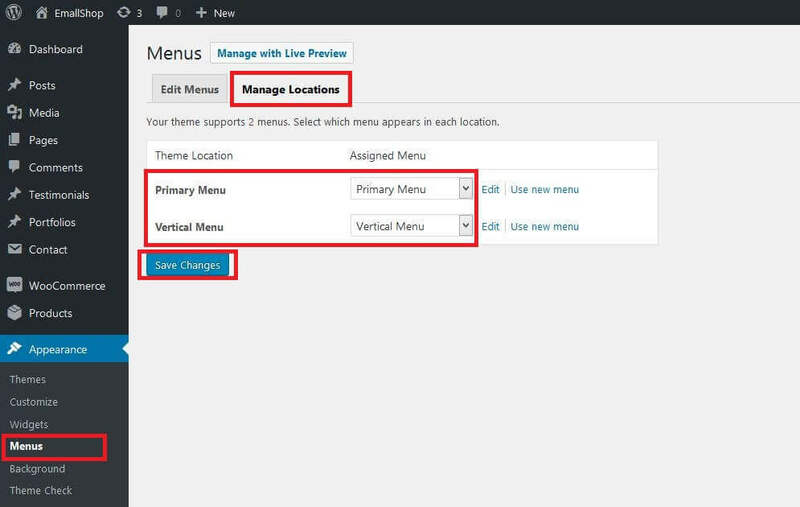 Once you have created your menu you can assign it to a specific slot in the Manage Locations tab. 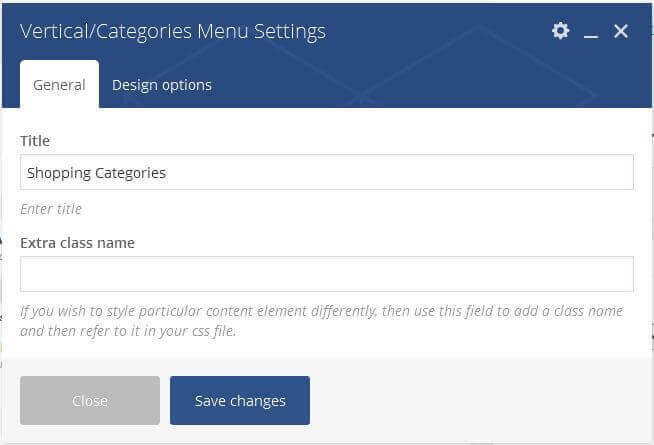 If you create header menu then assign Primary Menu and If you create categories/vertical menu then assign Vertical Menu. 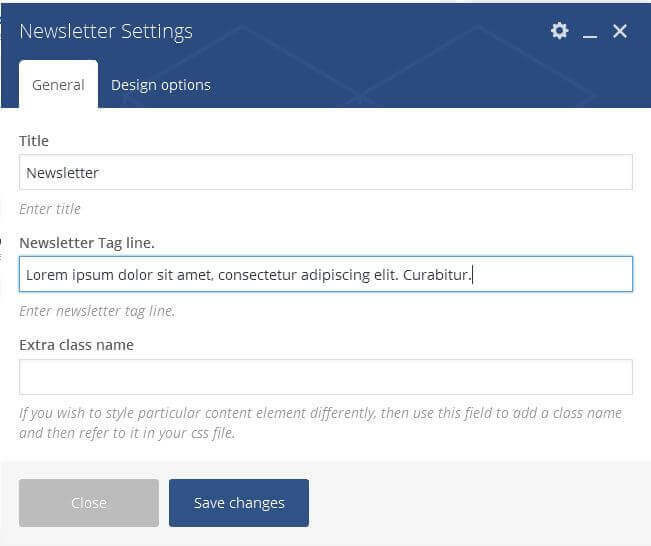 If you want to add Menus to your Sidebars/Footers you can do so under Appearance > Widgets by adding a Menu widget to the widget area of your choice then selecting the specific menu you want to use there. Creating MegaMenus is very similar to creating a regular multilevel menu, in fact all you need to do to create a MegaMenu from a regular menu is checked Enable EmallShop Mega Menu (only for main menu) to the top level Menu item. Create MegaMenu and set background image. Create MegaMenu so you can checked Enable EmallShop Mega Menu (only for main menu). MegaMenu view in full width so you can checked Full Width Mega Menu (overrides column width). Show Number of column megamenu so you can select column number in Mega Menu Number of Columns dropdown box. Set megamenu background image so you can upload image. Set FontAwesome icon of each menu before text. Set MegaMenu column width, Disable megamenu column title and set column image. Set megamenu column width so you can add number of column width in percentage (ex. 45%). Disable megamenu column title so you can checked Disable Mega Menu Column Title . Set megamenu column image in title below so you can upload image. Add Widget in sub level megamenu. First of add widget in widget area then after select widget area in sub level of megamenu. Create megamenu menu level in below image. 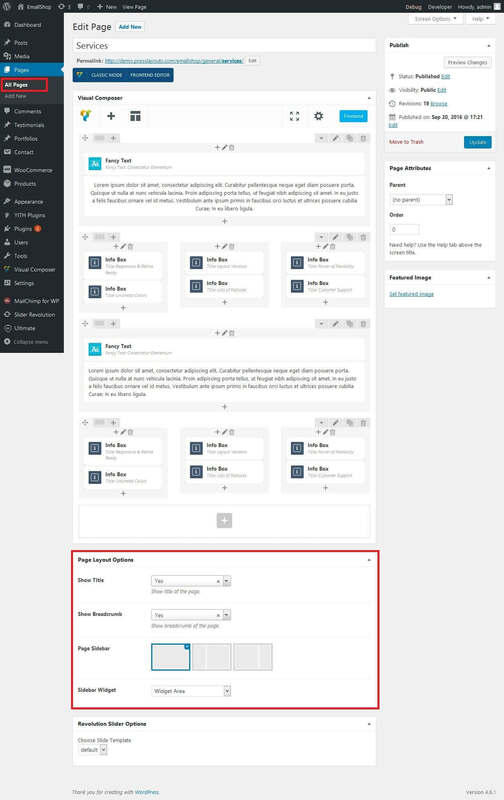 You can customize your Post/Page Sidebar Layouts on a per Post/Page basis while editing your Page/Post bottom Page Layout Options. By default Pages/Posts have a right sidebar. You can select first sidebar position Right Side, Left Side or Full Width. Then after select sidebar widget area. This is also the area where you add new sidebars. Go to Appearance > widgets and enter custom widget area name and click on Add Widget Area in bottom widgets page. It will now be available for your to edit and appear under the Widgets area (check next section - Widgets). 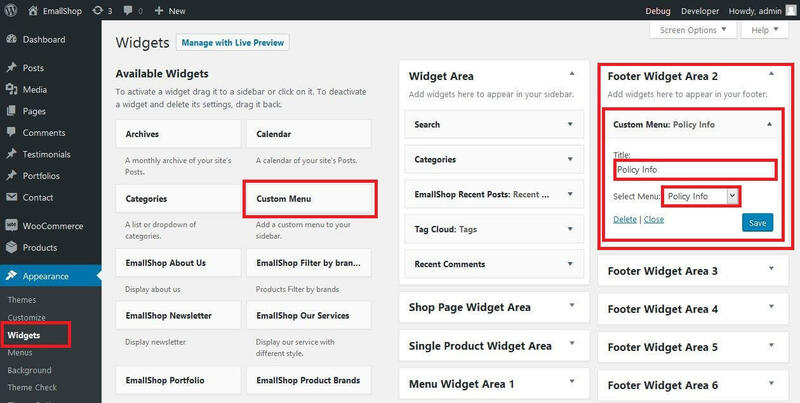 You can customize your sidebars and footers with EmallShop easily by adding custom widgets to your widget areas (Sidebars/Footer columns). By default EmallShop comes with the following widget areas: Widget Area, Shop Page Widget Area, Single Product Widget Area, Menu Widget Area 1, Menu Widget Area 2, Menu Widget Area 3, Footer Widget Area 1, Footer Widget Area 2, Footer Widget Area 3, Footer Widget Area 4. 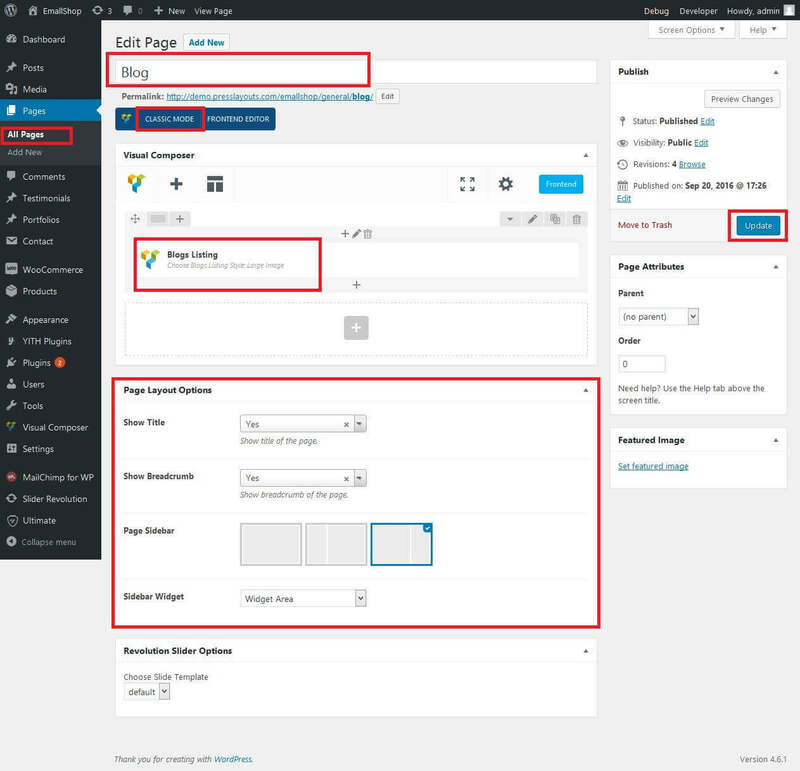 Your Blog page and posts use the Widget Area by default. You can change the sidebar on a per Post/Page basis. Go to Appearance > Widgets in your Dashboard. You will see your available Widgets to the left and your available Widget areas to the right. Drag Any widget you want to add to a Widget Area from the left section onto the right and into the Widget Area box you are going for. Your Custom Widget Area you have created bottom Widgets page will also appear to the right as well as the Footer Widget Areas. Go to Appearance > Widgets in your Dashboard. After add widget in Shop Page Widget Area to the right. Go to Appearance > Widgets in your Dashboard. After add widget in Single Product Widget Area to the right. Go to Appearance > Widgets in your Dashboard. After add widget in Footer Widget Area1, 2, 3, 4 to the right. 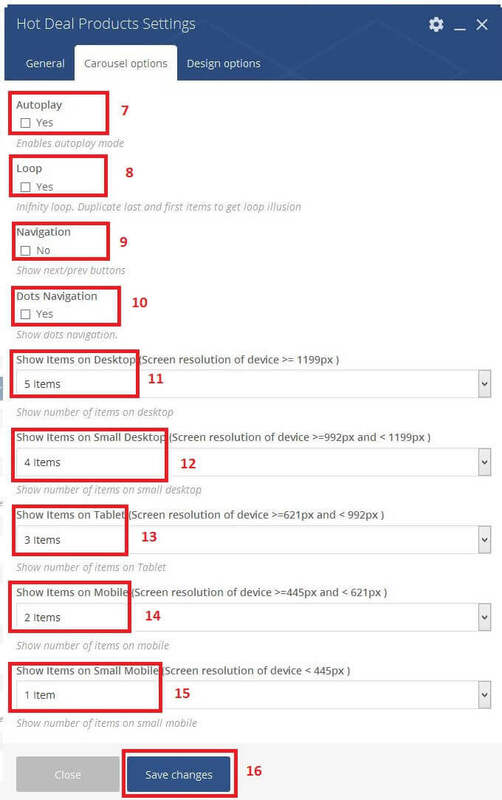 The sizes listed below determine the maximum dimensions in pixels to use when adding an image. If you want to change/set your own size, you can change here and with ratio of shop page image 6:7(Width:Height). Upload header logo image with 200 x 45 size. Upload post featured image with 960 x 540 size. Upload portfolio featured image with 770 x 500 size.  Upload product image with 850 x 995 size.  Upload brand image with 250 x 132 size. Go to Appearance > Theme Options > General. Go to Appearance > Theme Options > Theme Styling. 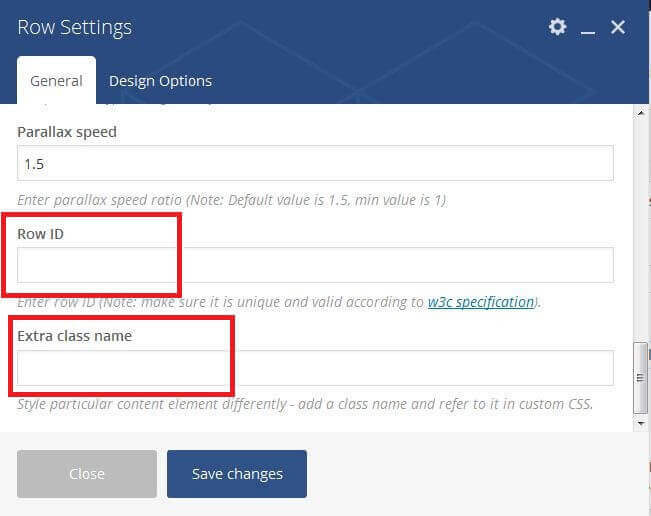 You can manage using Typography options change theme font style, size, weight, etc..
Go to Appearance > Theme Options > Header. EmallShop Theme offers a flexible footer with up to 4 widget areas that you can customize anyway you please. You can also pick a color preset for it as well as set your Copyrights text . Add any social icon you want to your footer. Go to Appearance > Theme Options > Footer. Go to Appearance > Theme Options > WooCommerce. 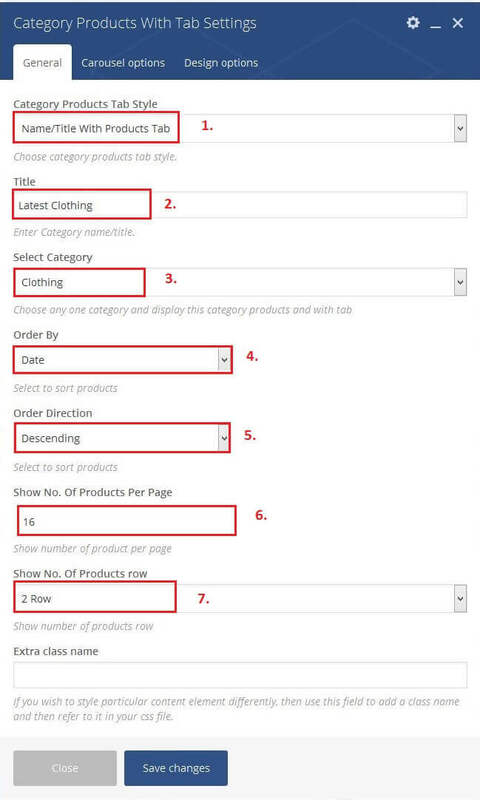 Go to Appearance > Theme Options > WooCommerce > Shop/Category. Go to Appearance > Theme Options > WooCommerce > Single Product. 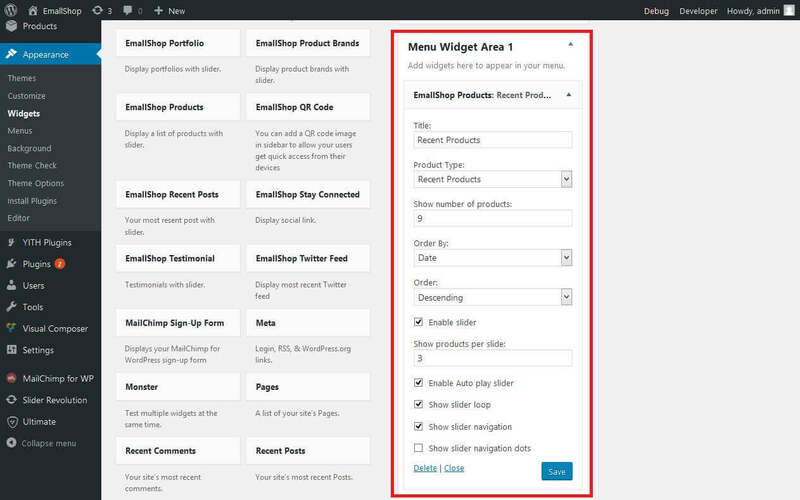 Go to Product > Add New and set product size guide image. 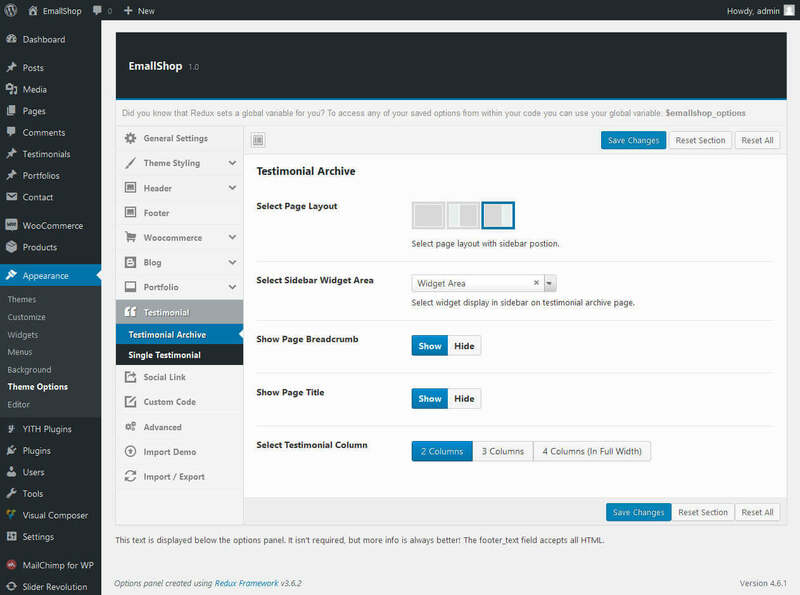 Go to Appearance > Theme Options > Blog > Blog/Archive Page. Go to Appearance > Theme Options > Blog > Single Post. Go to Appearance > Theme Options > Portfolio > Portfolio Archive. Go to Appearance > Theme Options > Portfolio > Single Portfolio. 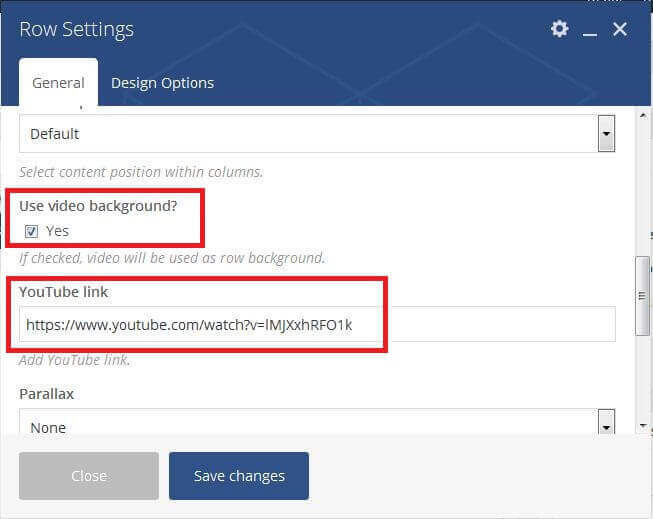 Go to Appearance > Theme Options > Social Link/Share. Go to Appearance > Theme Options > Cookie. 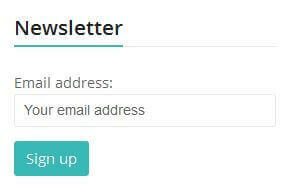 Go to Appearance > Theme Options > Newsletter. Go to Appearance > Theme Options > Custom Code. EmallShop is fully compatible with Woocommerce so you can start your online shop with it in a matter of minutes. All you need to do is install Woocommerce plugin, setup your products and start selling! 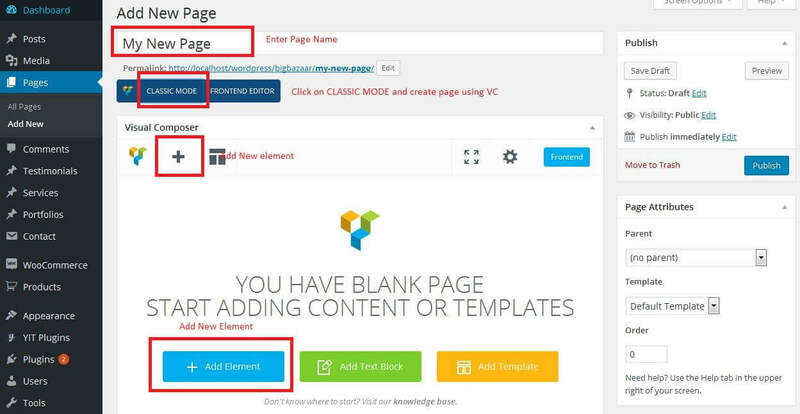 Notice- If you want use our theme demo content and import demo, You first import demo data/content after follow below steps. 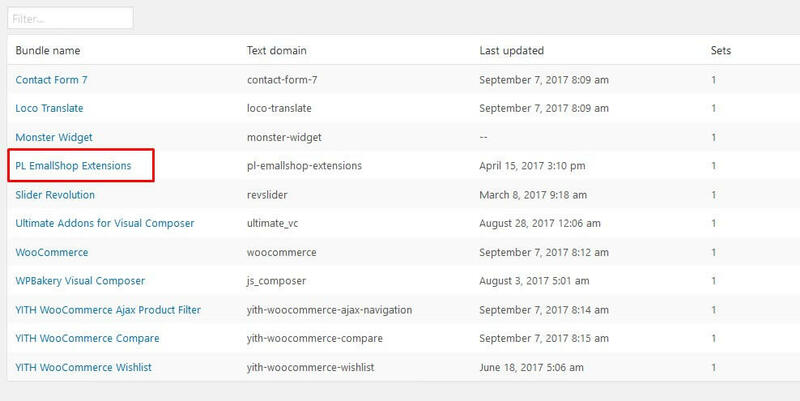 How To Install WooCommerce WordPress Plugin? 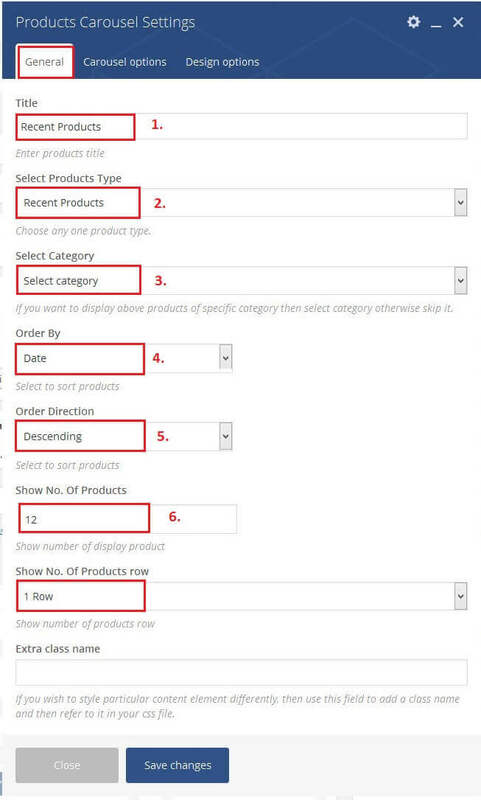 How To Import WooCommerce Dummy Data? How To Get Better Product URL With Custom Permalink? How To Use Shop Page For Homepage? 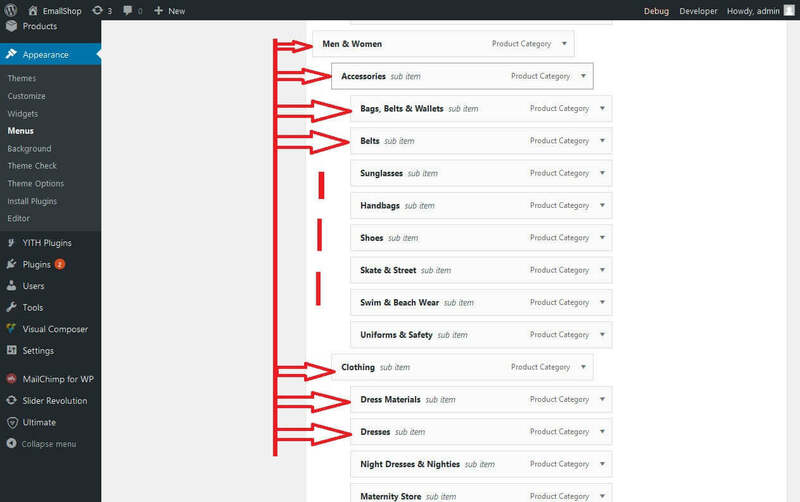 How To Display Product Categories On Shop Page? How To Change Shop Currency? How To Add A Simple Product? How To Sell A Service Product? How To Sell A Digital Product? How To Sell An Affiliate Product? How To Add A Variable Product With Variations? What Are Up Sells and Cross Sells? How To Create A Coupon Code? How To Add Terms & Conditions At Checkout Page? How To Enable Registration On "My Account" Page? What is System Status page? Go to Pages > Add new in your Dashboard. Add a Title to your Page (top field). Switch to Backend Editor if you are currently under Classic Mode (button below Title field). 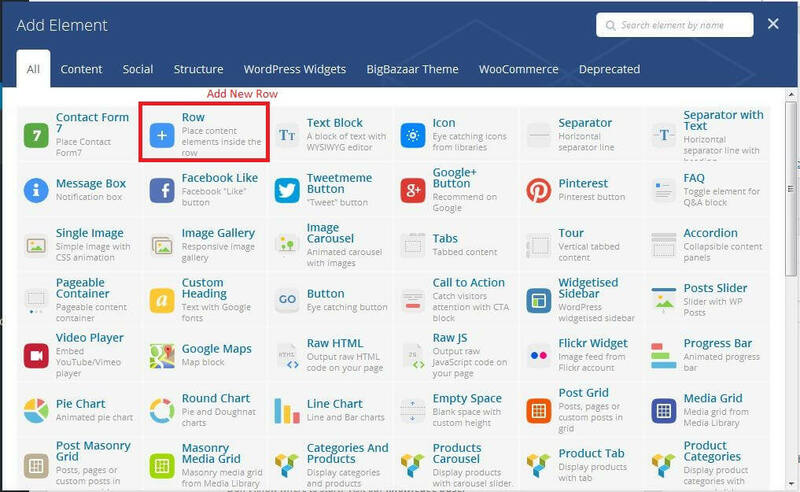 Start adding page content by clicking on the Plus button or Add Element. The Add Element Popup appears, click on the first element in order to add a new Row to your page. 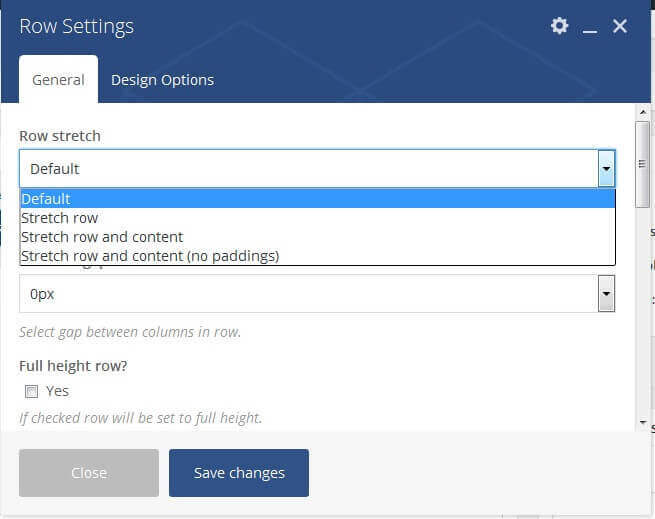 A Row is a main building block of a page, you can split your Rows into Columns, place various elements into your rows, set Row Backgrounds, effects etc. Once you have the new Row added to your page you can split that Row into Columns in order to organize elements nicely in it. Once you split your Row into column you can start adding different Page Elements into your columns. If you want to edit your Row/Column Settings click on the small Pen icon (top right corner of the Row/Column). You can also Duplicate your Row with the Icon (duplicate icon) next to it or Remove the Row/Column with the icon to the right (trash bin icon). Set your Row stretch setting. 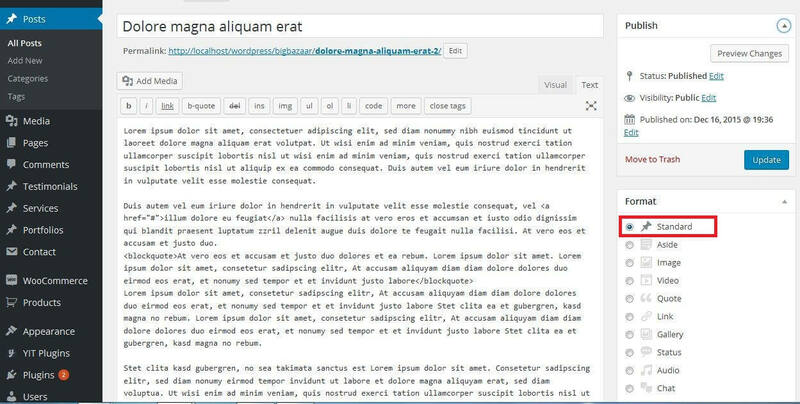 Default will have your Row to follow your regular wrapper content width and the content within the Row to go into the center. Select Stretch Row if you want your Row to go full width on your screen and the content to go into the center along with the regular wrapper content width - useful when you want content in the center but you want a full-width background of your row. 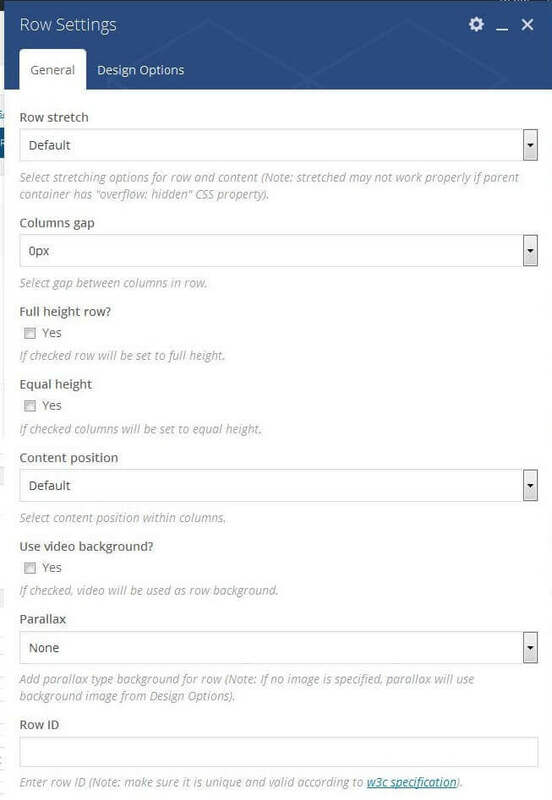 Select Stretch Row and Content if you want your Row to go full width on your screen and the content to go flow full width as well outside of the regular wrapper content width but with some padding to the sides - useful when you want content to flow full width of your screen and you want a full-width background of your row. Select Stretch Row and Content (no paddings) if you want your Row to go full width on your screen and the content to go flow full width as well outside of the regular wrapper content width with no padding to the sides - useful when you want content to flow full width of your screen and you want a full-width background of your row. Please experiment with all of these options after you set a Background color to your Row and add some elements to your Row's columns in order to understand how they work. Check this option if you want your Row to automatically stretch to your screen's height. If checked you can also pick the Content Position in a dropdown below. 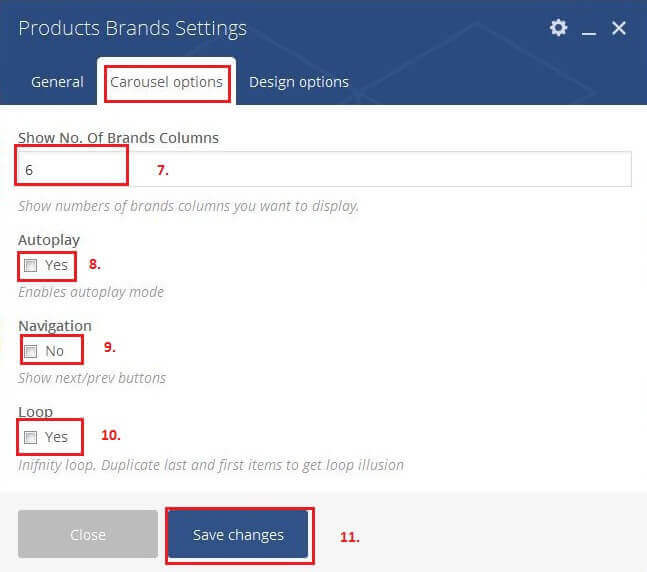 Selecting an option here different than None will let you set a background image to the Row with Parallax Effect on Scroll. You can either upload a new image or set one from your Library. The difference between Simple and With Fade is in that With Fade adds an extra Fade Out effect to your Row content on user scroll (content fades out once Row is scrolled down). Click on one of the Plus Icons within the column you want to add a new element to. The Page Elements dialog will appear, click on the element you want to add to your Column/Row. The Element Settings Dialog of the Element you are adding appears. Customize your element anyway you please, then click Save. 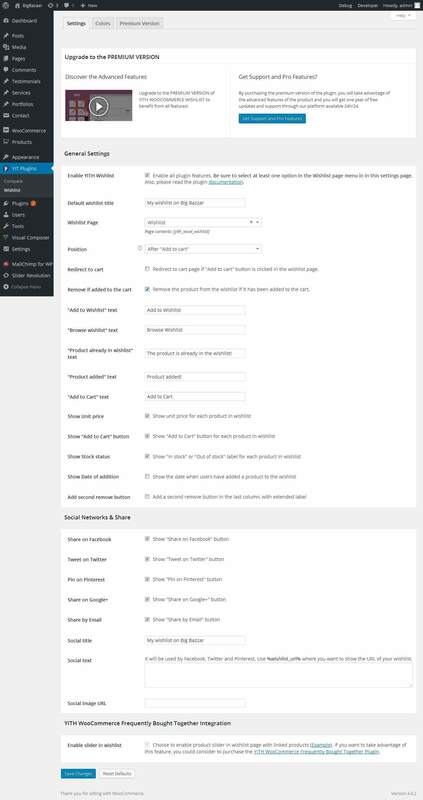 Page settings on a per page basis while editing your page under the each per Page Layout Options. Show Title - Show page title or no of the page. Show Breadcrumb - Show page Breadcrumb or no of the page. Sidebar Position - Choose sidebar position of the page/post. Sidebar Widget - Choose widget of sidebar. Creating Posts with EmallShop is pretty straightforward. Follow the steps below to create your own Posts now. Go to Posts > Add New in your Dashboard. Enter your Post Title at the top of the Edit post. Select Post Format, Category, Tags and other meta data if you want it. Upload a Featured Image for this Post. Standard - This is the Standard Post type with a single Featured Image that displays on top of the Post content. You can manage Post Categories via the Dashboard > Post > Categories section or straight into the Post Editor. While editing a Post find the Categories section to the right, check the boxes of the existing Categories you want to add this Post to or add a new Category below. You can manage Post Tags via the Dashboard > Post > Tags section or straight into the Post Editor. While editing a Post find the Tags section to the right, type in the new Tag you want to add to this Post or click on the Choose from the most used tags Link in order to see the existing tags and add one of them by clicking on it. Creating a blog Page is quite easy with EmallShop. 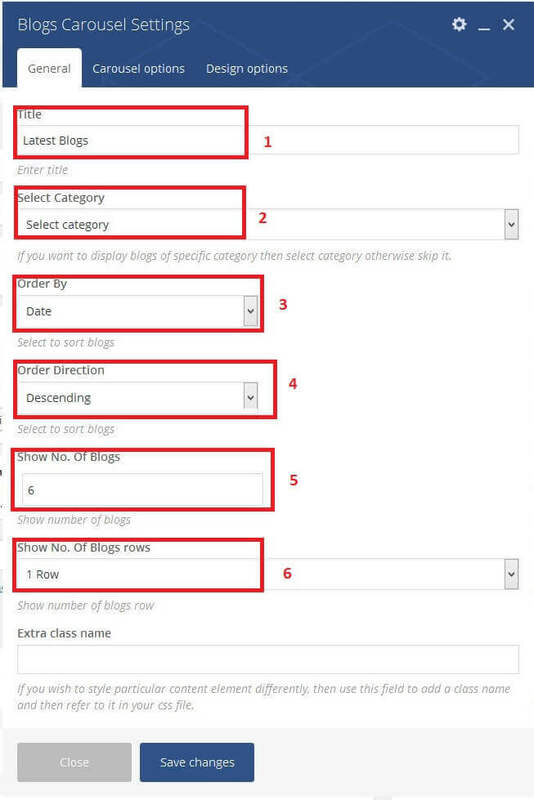 Follow the steps below the create a blog Page with a category Filter dropdown in the top right corner. Enter your Blog page Title. 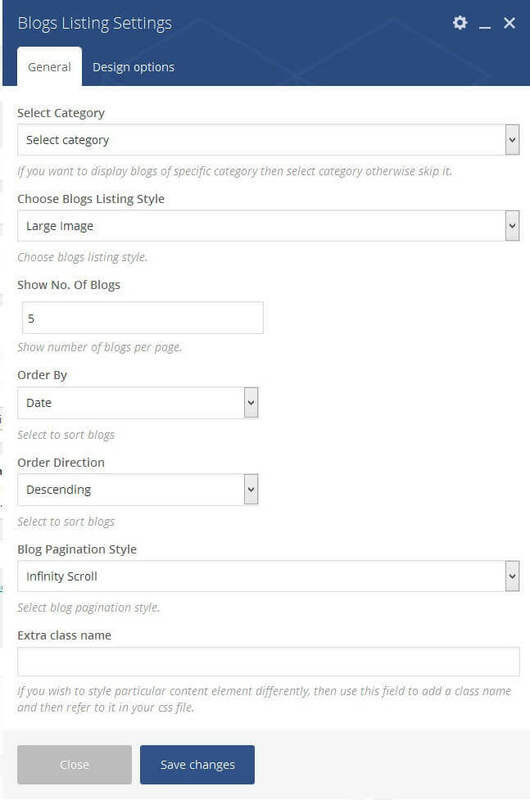 From the Page Attributes > Template dropdown in the right select the Blog template. Save and you are Done! Show Title - Show blog page title or not. Show Breadcrumb - Show blog page breadcrumb or not. Show Posts Per Page - Show number of post per blog page. Blog Style - Select blog page style. Available 3 type blog page style Large Image, Small Image and Masonry Grid. Show Post Columns - Show post column of the blog page. 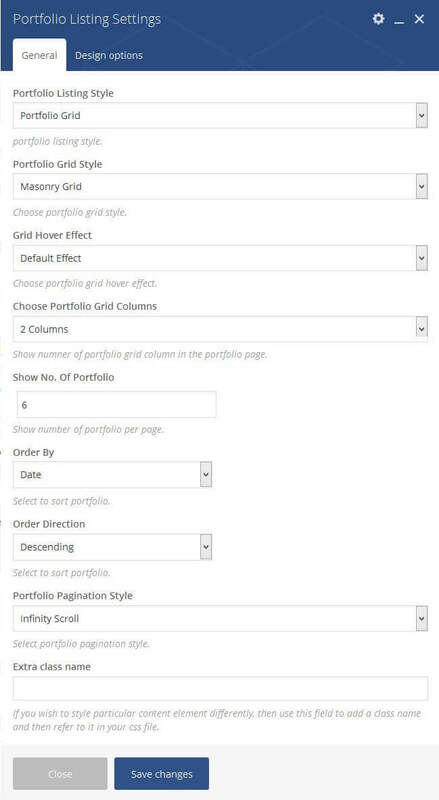 Column option apply only on above masorny grid option. 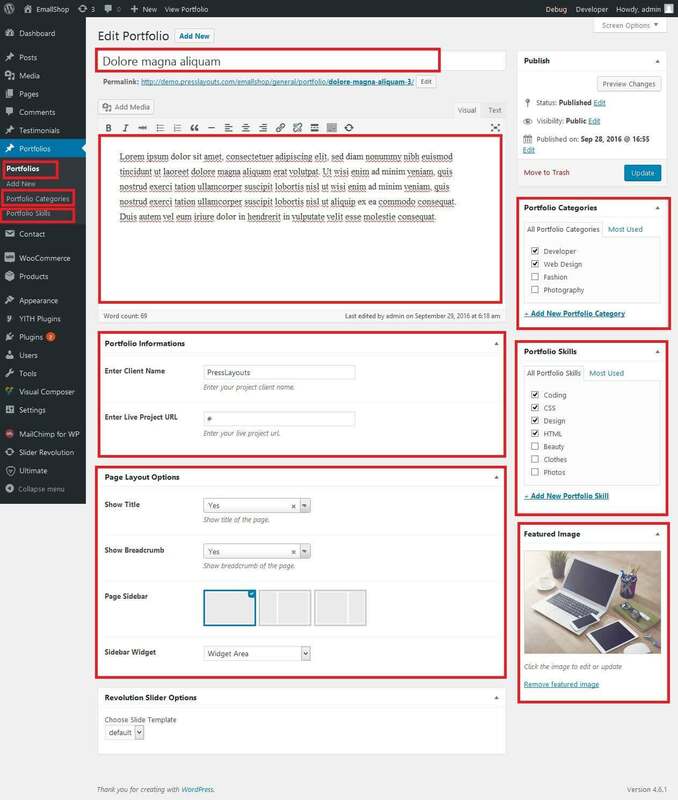 EmallShop has some custom Theme Options related to Blog that will help you manage your blog page and post detail page. Head over to Appearance > Theme Options > Blog to explore them. Go to Portfolio > Add New in your Dashboard. Enter your Portfolio Item Title at the top of the Edit Portfolio. Select Portfolio Category, Portfolio Skills on right side and enter other portfolio information in content bottom. Upload a Featured Image for this Portfolio Item. You can manage Portfolio Categories via the Dashboard > Portfolio > Categories section or straight into the Portfolio Item Editor. While editing a Portfolio Item find the Portfolio Categories section to the right, check the boxes of the existing Categories you want to add this Portfolio Item to or add a new Category below. Make sure you have your categories set up before trying to create a Filterable Portfolio Page or a filterable Portfolio Grid. You can manage Portfolio Skills via the Dashboard > Portfolio > Skills section or straight into the portfolio Editor. While editing a Portfolio find the Skill section to the right, type in the new Skill you want to add to this Skill or click on the Choose from the most used skill Link in order to see the existing skill and add one of them by clicking on it. Creating a Portfolio Page is quite easy with EmallShop. Follow the steps below the create a Portfolio Page with a category Filter dropdown in the top right corner. Enter your Portfolio page Title. 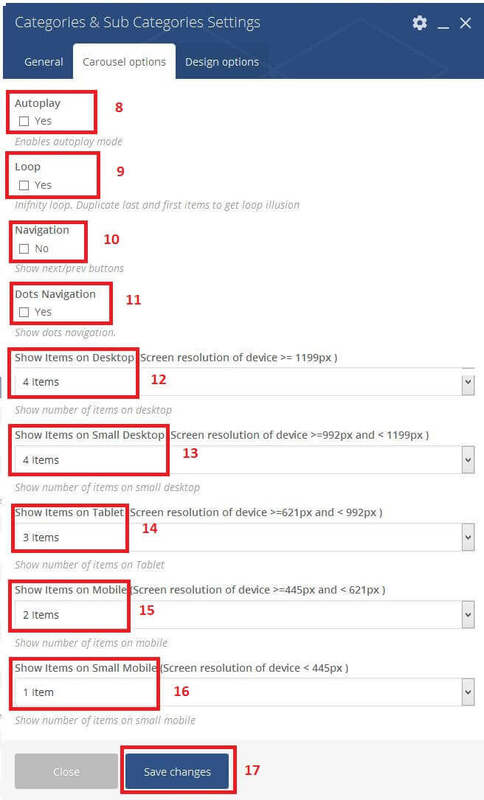 From the Page Attributes > Template dropdown in the right select the Portfolio template. Save and you are Done! Show Title - Show Portfolio page title or not. Show Breadcrumb - Show Portfolio page breadcrumb or not. Show Portfolio Per Page - Show number of Portfolio per Portfolio page. Select Portfolio style - Select Portfolio page style. Available 2 type Portfolio page style Normal Grid, and Masonry Grid. Show Portfolio Columns - Show portfolio columns of the page. Sidebar Position - Choose sidebar position of the Portfolio page. EmallShop has some custom Theme Options related to Portfolio that will help you manage your portfolio page and portfolio detail page. Head over to Appearance > Theme Options > Portfolio to explore them. 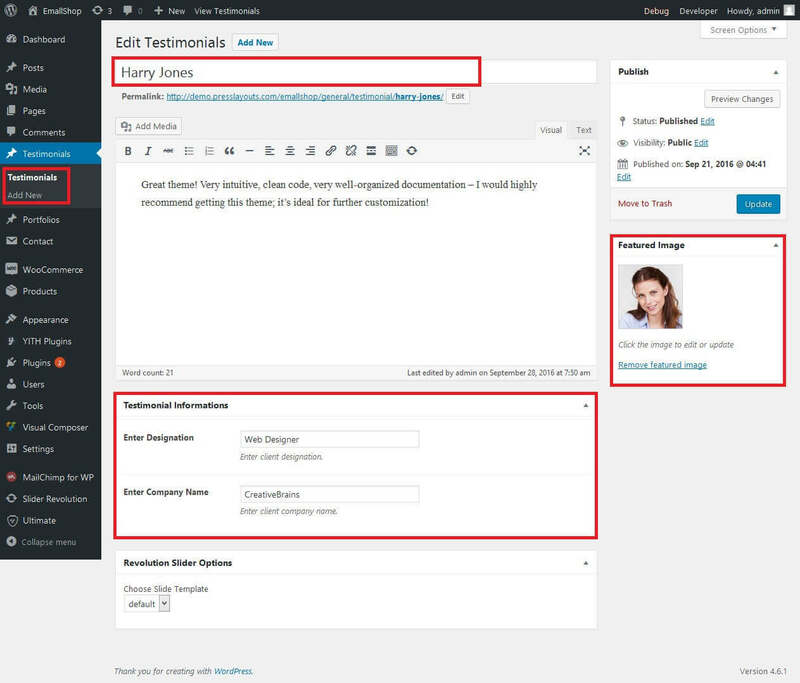 Go to Testimonials > Add New in your Dashboard. Enter your Testimonial Title at the top of the Edit testimonial. Upload a Featured Image for this Testimonial user. 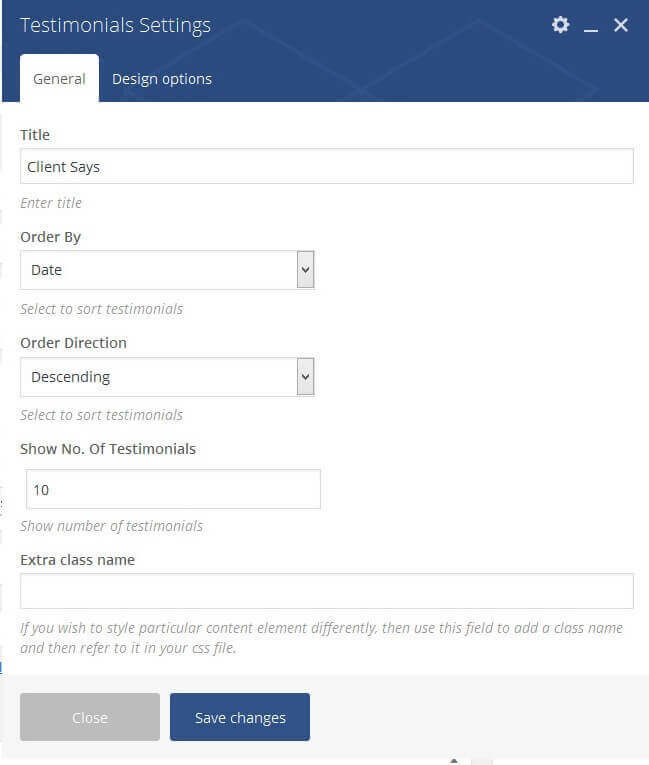 Enter Designation and Enter Company Name of use in Testimonial Options under content bottom. 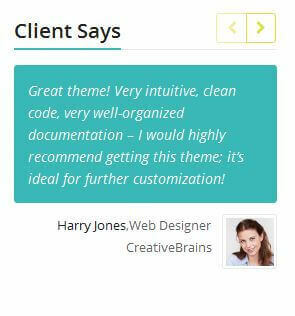 EmallShop has some custom Theme Options related to Testimonials that will help you manage your testimonials page and testimonial detail page. Head over to Appearance > Theme Options > Testimonial to explore them. 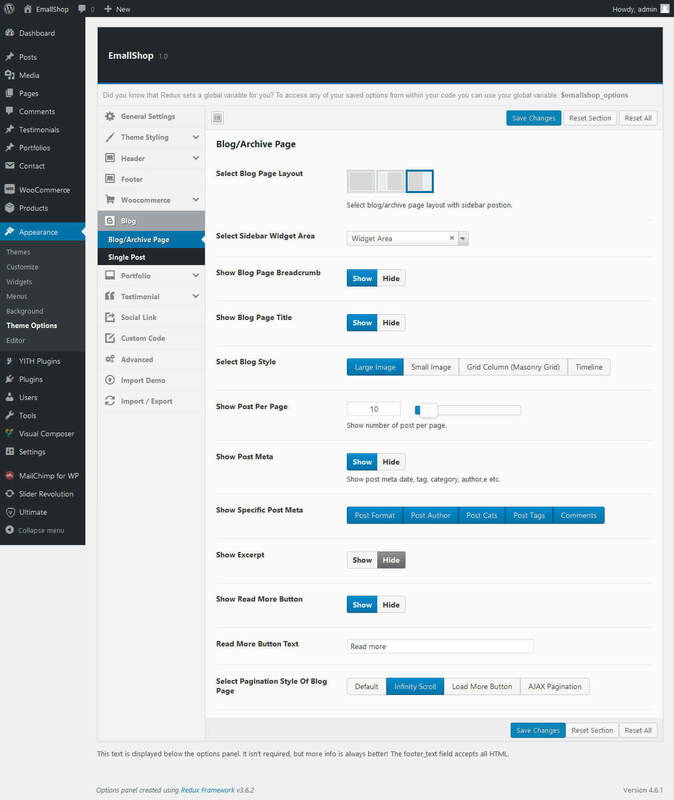 EmallShop Theme package contains Page Builder plugin. It's a great plugin and we recommend using it as a primary tool for building your site's content. 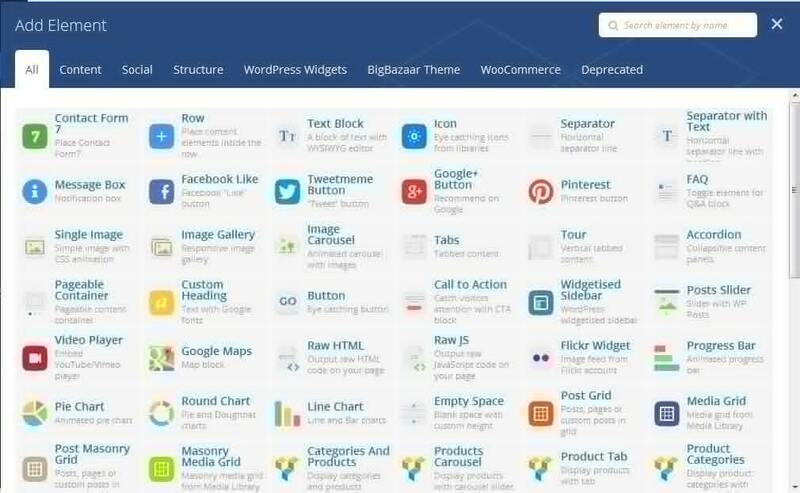 WPBakery Page Builder (formerly Visual Composer) free video tutorials will quickly guide you through everything you need to know about WPBakery Page Builder to create WordPress site. 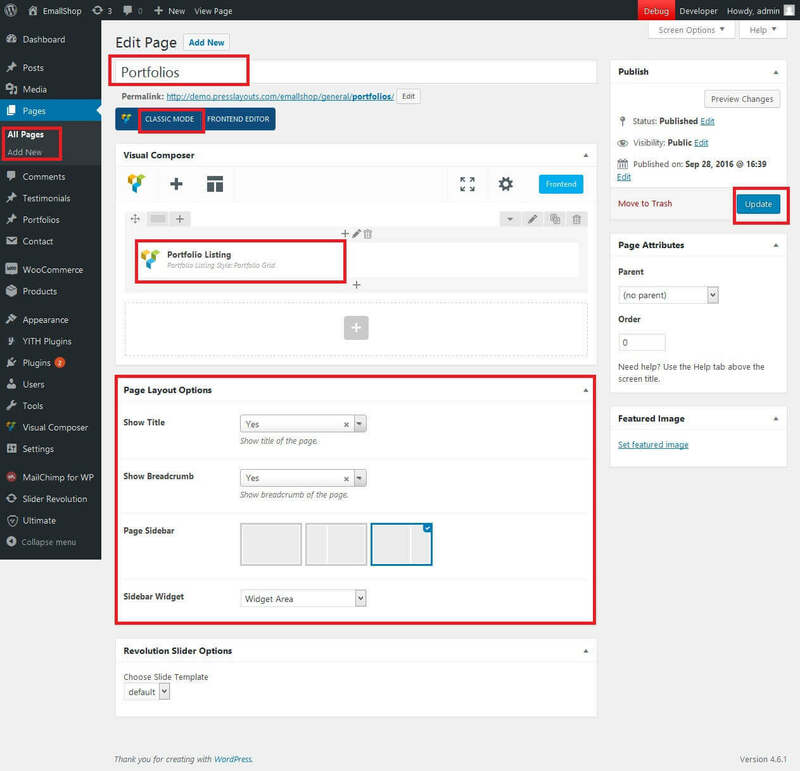 Video tutorials are created in a way that even pro WPBakery Page Builder user or WordPress developer will discover helpful tips and hidden features of the most popular page builder plugin for WordPress. 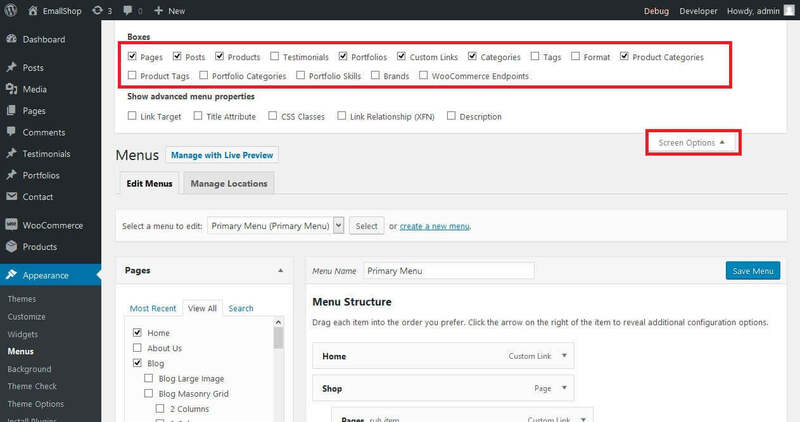 Don’t have your own copy of WPBakery Page Builder yet? 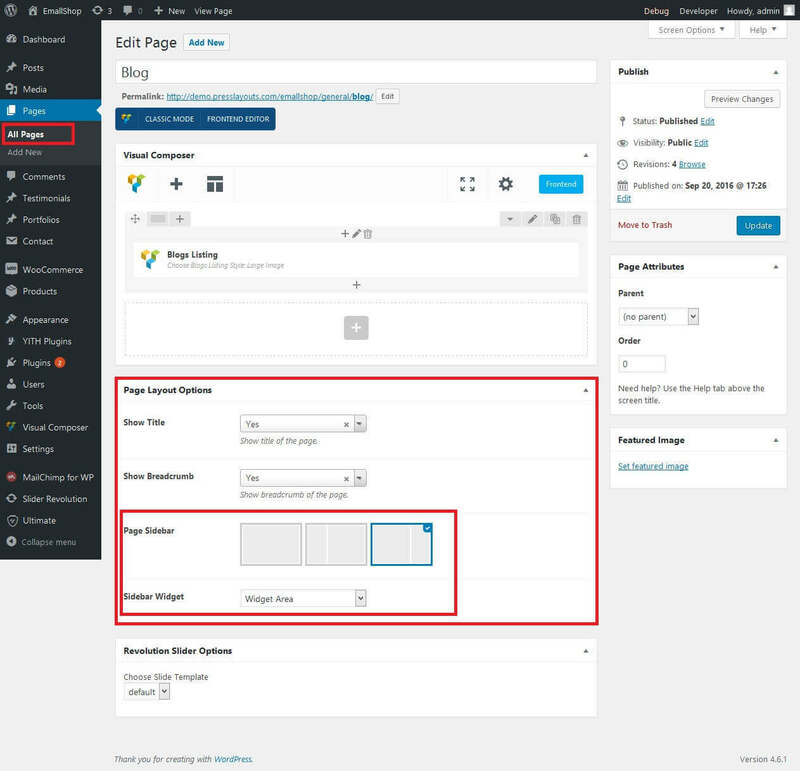 Video tutorials will show you how WPBakery Page Builder can help you to build your WordPress site. Revolution Slider comes with EmallShop Theme for free and should be used only with EmallShop Theme. Please read the documentation and tutorials on how to use Revolution Slider here. Then replace them with the folders/files located inside the "revslider" folder that can be found inside the revslider.zip file from your package. Never uninstall/reinstall the plugin, as that would also delete your previously built sliders. Instead, as long as the following instructions are followed, any previously built sliders will be saved and still exist once the update process is complete! Read more on how to Create your own Contact Forms a few sections up in Creating Contact Forms or find out more on the plugin Contact Form 7 Plugin Documentation. 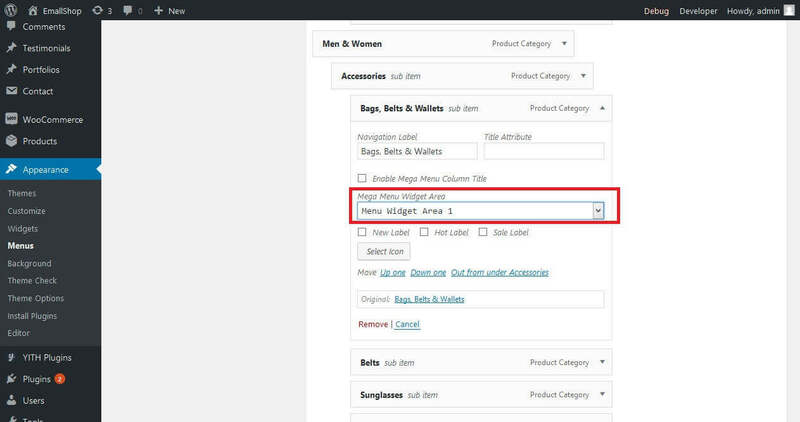 WooCommerce product filter widget, WooCommerce Ajax Product Filter lets you apply the filters you need to display the correct WooCommerce variations of the products you are looking for. 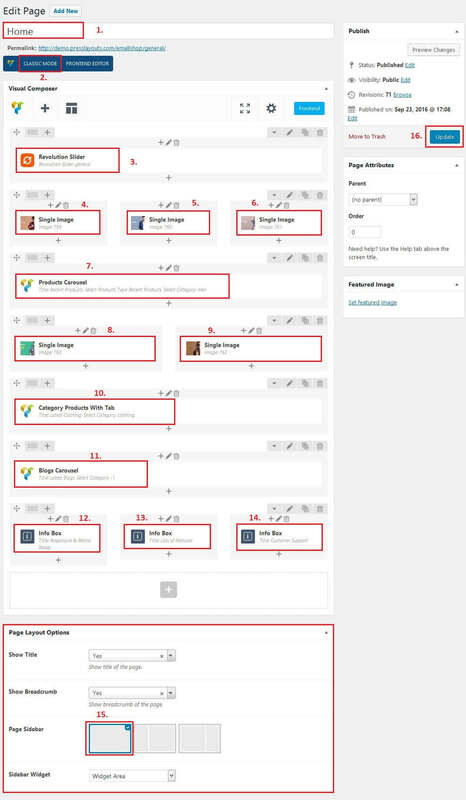 These Plugins allow users adding products to wishlist them. These Plugins allow users adding products to comparing them. 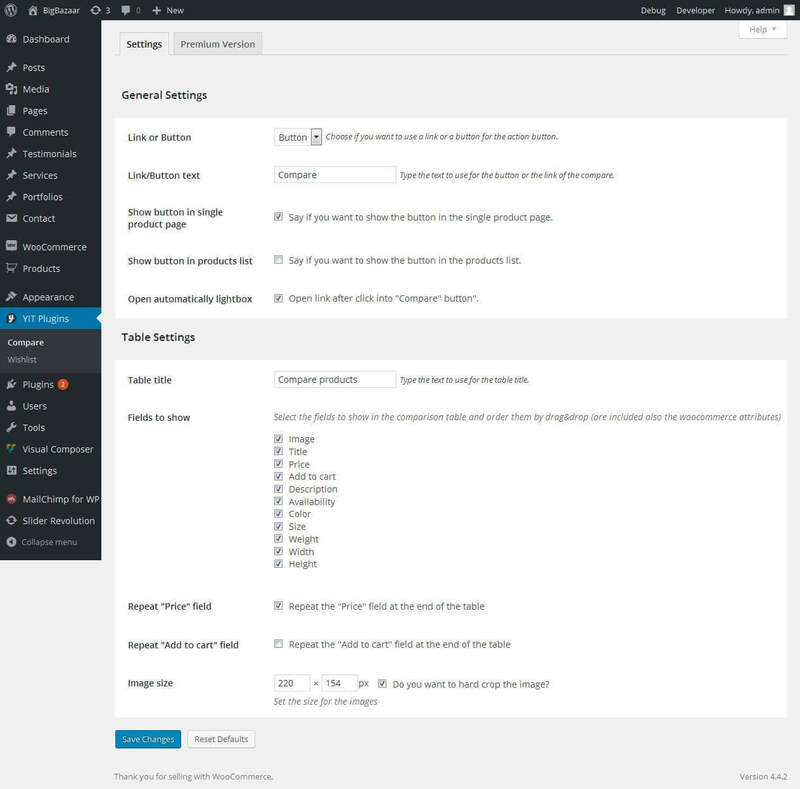 MailChimp for WordPress comes with a free plugin, which is awesome by itself. It is actively used on nearly half a million sites and has been very well received by the WordPress community. CleverSwatches – WooCommerce Color or Image Variation Swatches. Convert your normal variable attribute dropdown select to nicely looking color or image select. You can display images or color in all common size. Display them in round or square mode. CleverSwatches allows you to add multiple gallery images for each variation and when visitor selects the variation those gallery images will be shown as gallery images instead of main product gallery images. 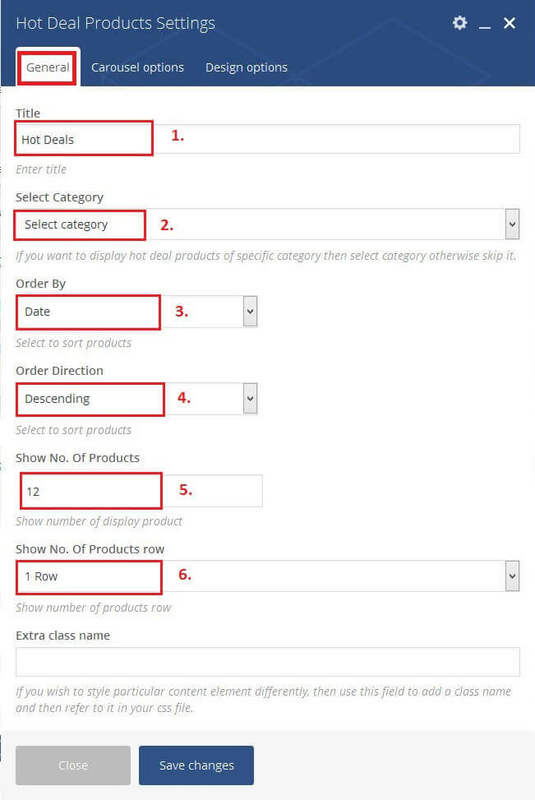 You see below screenshot and set our(Emallshop) theme requirement setting. Together with Visual Composer default shortcode, EmallShop has built in 11 other shortcodes, we have used both default shortcodes and our EmallShop shortcodes to build our EmallShop theme. Before you have read How to build Home page using Visual Compare? If you read more page build info then read Creating Pages section. This shortcode use to display product categories and products with tab of selected parent category. You can see first shortcode demo image and after setting in below image. 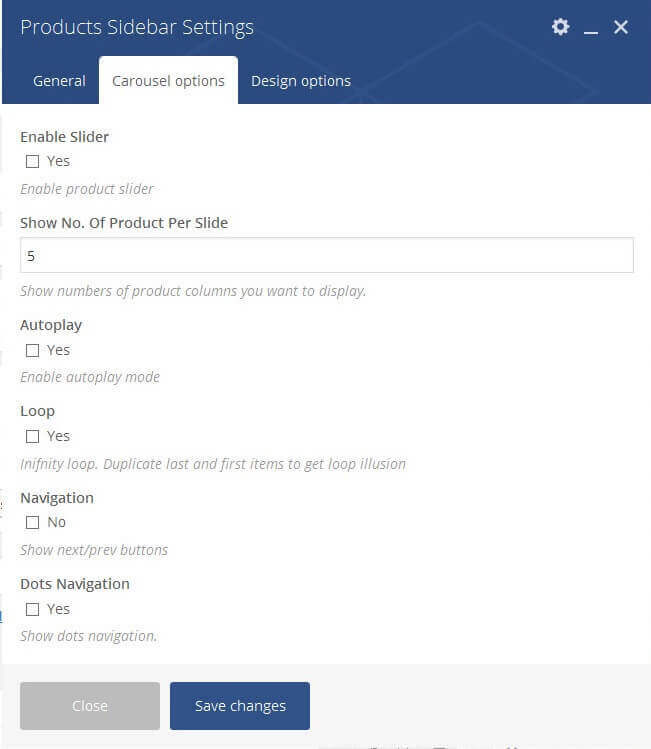 This shortcode use to display only one variation type of products with carousel slider. 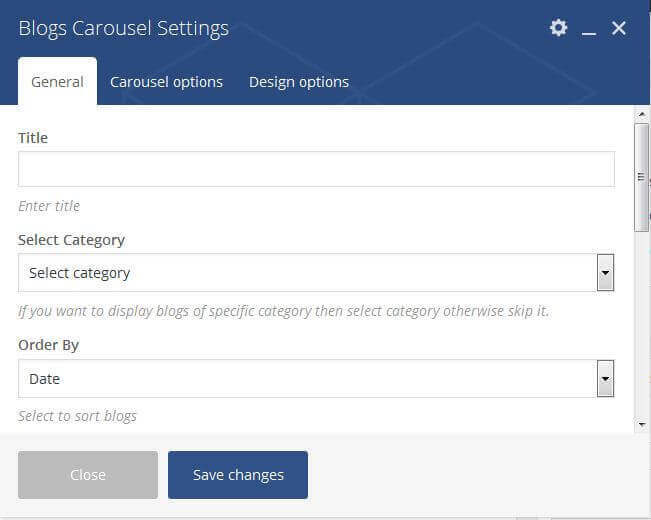 This shortcode use to display caregories and sub categories with carousel slider. This shortcode use to display product brands with carousel slider. 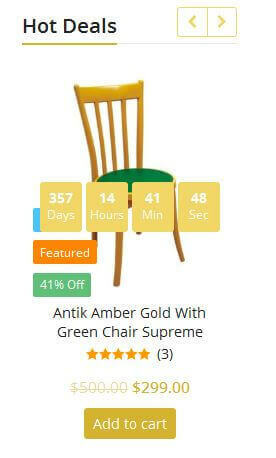 This shortcode use to display hot deal products with carousel slider. This shortcode use to display products on sidebar with carousel slider. This shortcode use to display vertical/categories menu. This shortcode use to display blogs with carousel slider. This shortcode use to display blogs listing in blog page. This shortcode use to display portfolios listing in portfolio page. 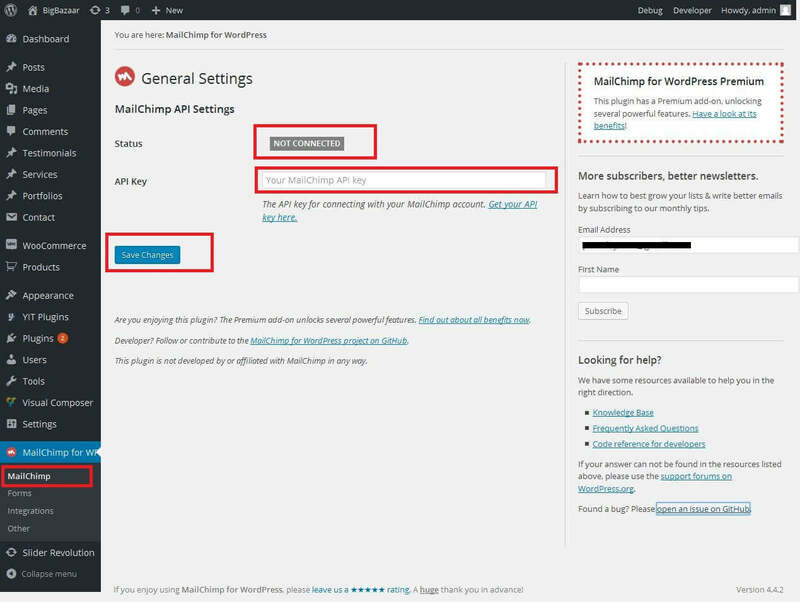 This shortcode use to MailChimp helps you to email the right people at the right time. You can send automated emails based on customer behavior and preferences, it will help the customer to receive all the information from your online shop. This shortcode use to display peoples say testimonial. 12) How to create home page? One again, thank you so much for using our theme. As i said at the beginning, i'd be glad to help you if you have any questions relating to this theme. No guarantees, but i'll do my best to assist. If you have a more general question relating to the themes. 1) How to Activate EmallShop Theme? 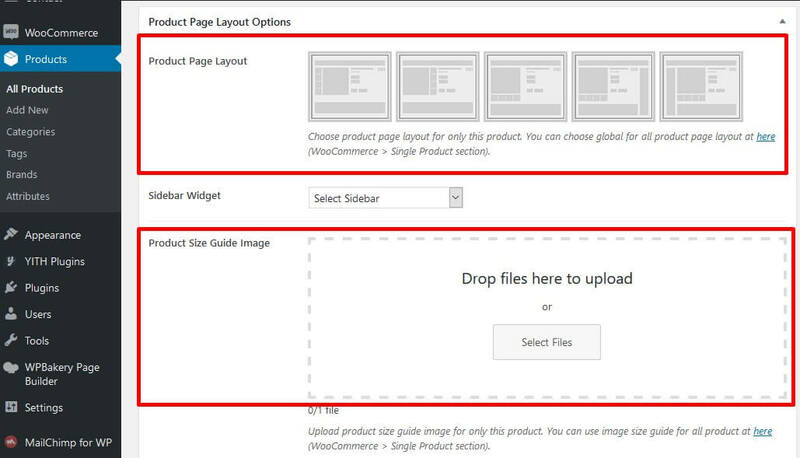 Use your purchase code to activate PressLayouts template. Please, note, that you won’t be able to use it without activation. You go EmallShop Activate on admin sidebar and activate EmallShop theme. To find your Purchase code, please, enter your ThemeForest Account > Downloads tab > choose PressLayouts > Download > License Certificate & Purchase code. 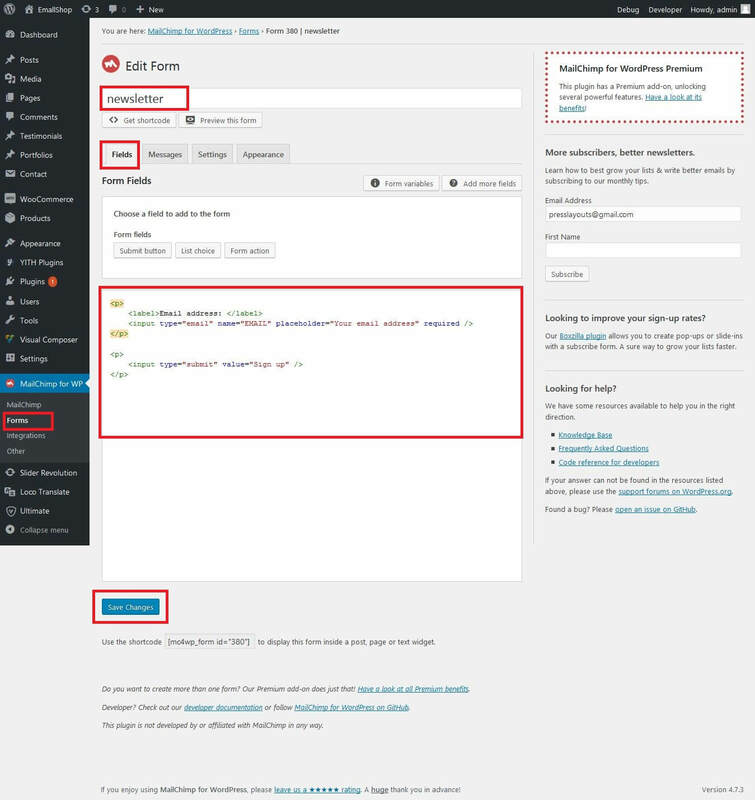 After enter purchase code in textbox and click on Activate Theme button and active theme. Activate PressLayouts template and get lifetime updates, 6 months of free top-notch support, 18/7 live support and much more. 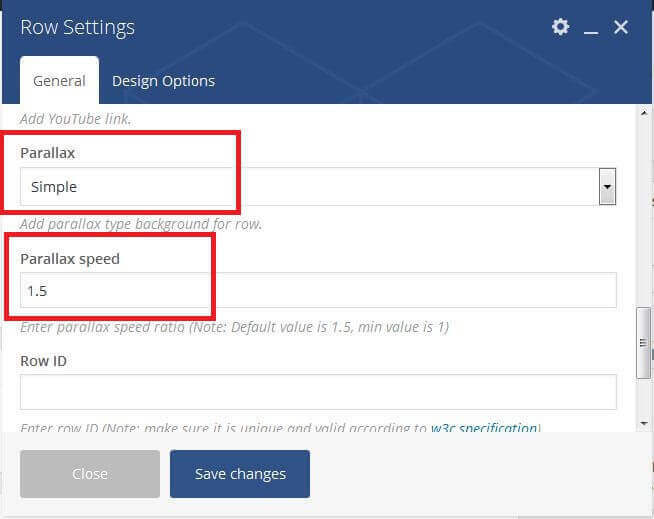 2) How to improve site loading speed? our theme is already optimized and don't have too many resources to make your website slow. Most likely, your website performance suffers from the content you have added to your website. It may happen in case of too many plugins, large not optimized images or other resources. So we suggest you to remove unnecessary plugins, install some kind of caching plugin. 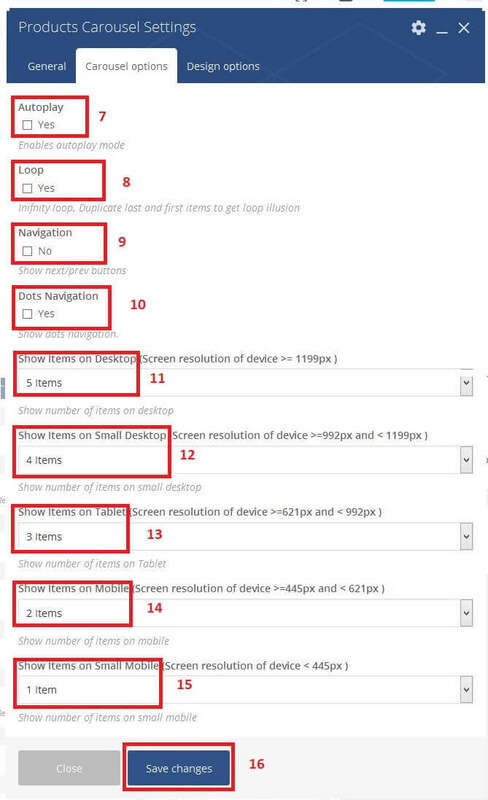 Also, you can use GTmetrix tool to see what makes your website slow and optimize these parts of your website. 3) How to setup Language Switcher and Currency Switcher? You can show wpml language switcher or wpml currency switcher. You should enable Show WPML Language Switcher and Show WPML Currency Switcher options in Theme Options > Header. Before enable these options, you should install WPML and WooCommerce Multilingual - run WooCommerce with WPML plugins. You should configure wpml language switcher in WPML > Languages > Language switcher options. You can see here for more details. You should configure wpml currency switcher in WPML > WooCommerce Multilingual > Manage Currencies. You can see here for more details. 4) How to update WPBackery Visual Composer, Revolution Slider, Ultimate Addons for Visual Composer And PL EmallShop Extensions Plugins? Important: Before update this plugin, you should delete this plugin in Plugins on admin sidebar. Please go Plugins on admin sidebar. Please go Appearance > Install Plugins on admin sidebar. Please extend below php configuration of our theme requirement in php.ini or Contact your host provider support team and extend below detail. 7) Sorry, you are not allowed to access this page. This error created when you import demo data with actived child theme, But if you import our Dummy/demo data, you first must be activated main theme and after you can import demo data not using child theme. Your dummy/demo data imported successfully, After you can active child theme. Visual Composer, Ultimate Addons for Visual Composer and Slider Revolution are bundled with the theme as part of Envato’s extended license. You do not need purchase it separately. Also please kindly note that this extended license does not allow you to activate the plugins separately with purchase codes. Activation is required only for updating the theme. You can continue using the plugins without activation/registration. When we have imported demo data successfully then some time display this type issue, but no worries. Below example image for general demo slider, But you go below directory on your server using FTP in plugin folder and choose your demo slider zip file and import again it, After resolve your query. 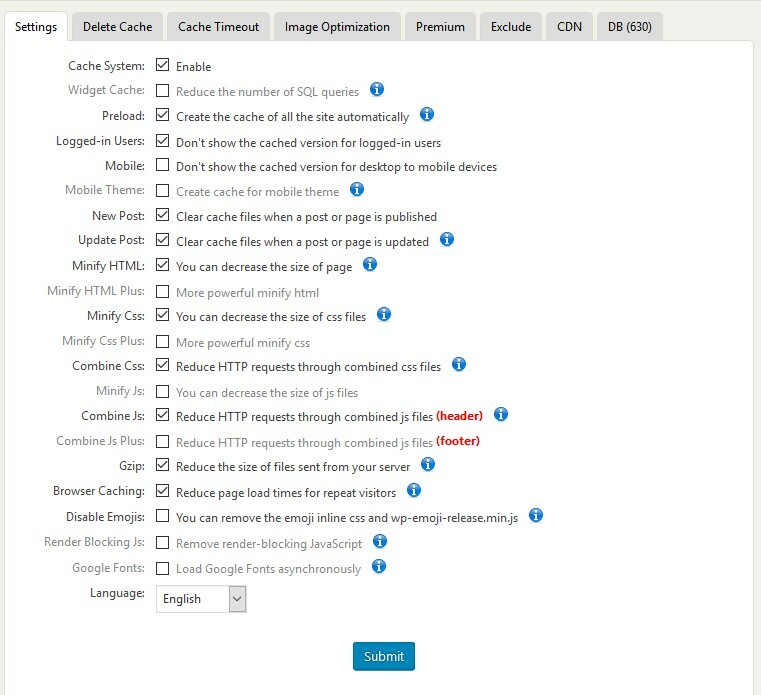 When you import our demo content, it can take several minutes depending on the speed of your server. Each time the button is clicked it will import the content, so if it is clicked twice it will import everything two times. There are two ways to get rid of duplicate content. Method 1: WP Reset Plugin – This plugin is the fastest way to get rid of content. However, it will remove all content from your database and leave the default theme activated. 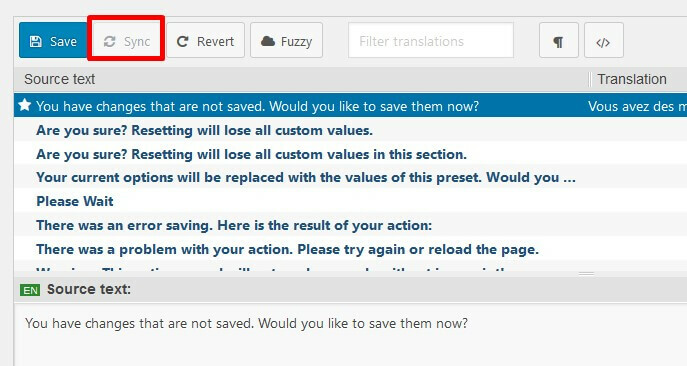 It does not remove plugins, but will deactivate them and remove all pages, posts, menus, sliders, widget data, etc. Basically it removes all the content that you imported from our theme. Only do this if you are able to start over. Click Here To Download. Method 2: Manual Removal – This method will take longer and simply involves manually removing duplicate items. 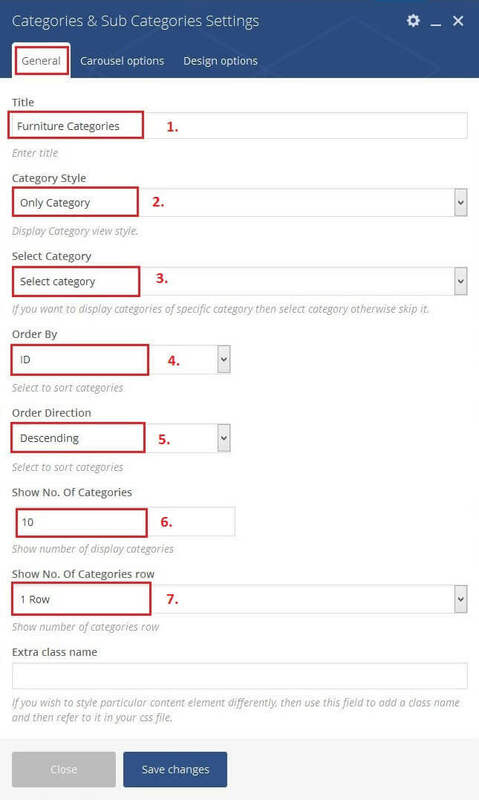 For example, go to the Appearance > Menu and delete and duplicate items one by one. Same thing for pages, post, sliders, etc. 11) How can change the product image sizes? 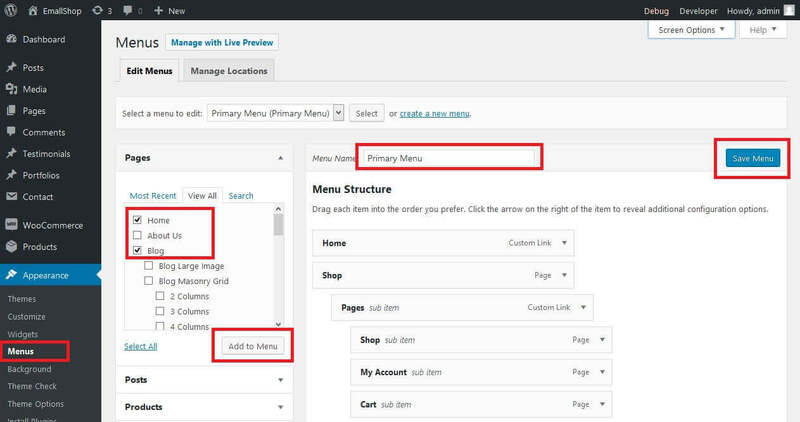 Please go Woocommerce > Settings on admin sidebar. Please go Product Images and change the image sizes. After change the image size, you should regenerate all the thumbnails in Tools > Regen.Thumbnails on admin sidebar. 12) How to show Registration Form on My Account page? Please check Enable registration on the "My Account" page in Registration Options. 13) Where can change the logos? Please go Appearance > Theme Options > General Settings > Logo, Icons on admin sidebar. Please upload or change the logos and the icons. 14) Where can find theme options? You can find in Appearance > Theme Options on admin sidebar. So please ZipArchive is needed by WP All Export. For the ZipArchive class to be present, PHP needs to have the zip extension installed. Please request its installation to your web hosting Support team, After resolve it. A “white screen of death” happens when there is a PHP error on the site but WP_Debug isn’t enabled on the server. So the first thing to do would be to enable WP_Debug so you can read what the actual error is and thus fix the problem.